6 WEDDING FOOD IDEAS TO PLEASE EVEN THE FUSSIEST EATERS! Your wedding should be one of the most magical adventures of your life, but it’ll most likely be the result of months of planning! A common problem might be deciding what food to serve in order to keep everyone full and happy! At The Insurance Emporium, we want everyone to enjoy their special day. That’s why we’ve come up with 6 wedding food ideas that should please even the fussiest eaters! 1. Won’t put a hamper on your day! 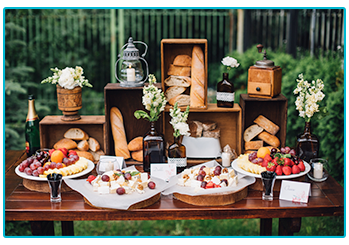 A twist on an outdoor picnic; providing each table with a food hamper could be a great way to bring the outside in! You could include food such as cheese, bread, cured meat, antipasti and mezze-type ingredients. It might be a really good method of getting the guests around your tables to interact as they all tuck in and share. It could also keep costs down as you can prepare them at home in advance! Barbecues don’t just have to be for back gardens! There are some fantastic BBQ companies and smokehouses who provide catering for weddings and events. You could opt for simple food like classic burgers and hot dogs. Alternatively, you might prefer to get a bit more adventurous with swordfish steaks and tasty marinades! There are plenty of inventive vegetarian options out there too, so make sure not to forget your veggie friends! 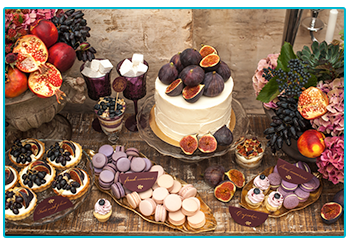 One of the biggest wedding catering trends at the moment are food stations! It can add a great DIY-feel to your wedding, with guests being invited to serve their own food and customise their meals. Some popular examples are potato bars, mac ‘n’ cheese and sushi. You could present the basic dishes alongside a variety of toppings and sauces, so your friends can customise their own food! 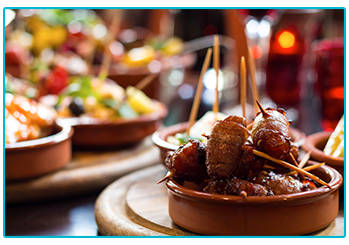 Tapas could be another fantastic way of getting your guests to socialise across the table! Presenting them with a collection of smaller dishes to choose from might also mean they can create their own meals from what’s on offer. Whilst traditionally Spanish, plenty of other cuisines are now getting aboard the tapas train! That means you could go for a worldwide selection of food which should hopefully satisfy the most and the least adventurous eaters! More traditional, but perhaps a great way to cater for all tastes, is a wedding buffet! You could go for an all-out classic buffet, with vol-au-vents, cheese and pineapple hedgehogs and cocktail sausages! However, if that’s not quite your style, you could opt for more contemporary foods. You could even come up with a theme and base your buffet choices around that! …pudding! An elaborate multi-tiered cake might be becoming a thing of the past, but dessert is still an important aspect of wedding food! Many couples are now going for a selection of cakes and desserts, sometimes even miniature canapé-style treats. One of the current pudding trends is in fact for pie! Versatile and homely, you can present guests with a variety of flavours. For those without a sweet tooth you could even offer a decorative pork pie! With so many options out there, you could have a lot of fun choosing the food for your wedding! Whether you’re going for something traditional or cuisine that’s more unusual, you might want to consider insuring your big day to give yourself peace of mind. The Insurance Emporium offer flexible Wedding Insurance to suit your lifestyle and budget from a one-off premium of £17.00*, as well as cover up to £25,000 for Financial Failure of Suppliers^. Visit The Insurance Emporium to find out more! * The one-off premium of £17.00 is based on a UK Wedding with the Amber Level of Cover and no Elective Benefits selected. ^ Cover of up to £25,000 for Financial Failure of Suppliers available on Diamond policies only.